The search function for grouped dates includes a drop-down, allowing you to search by year, month, or date. It does not allow you to search for an entire date, such as 04/19/2010. Year— Search results will be grouped by year. Month— Search results will be grouped by year and then month. The search term must be the long version of the month, such as January. Date— Search results will be grouped by year, then month, then day. Because the search will return partial matches, you should use the two-digit variation for dates. For example, to search for the 1st of a month, enter 01 instead of 1. If you enter 1, every date with a 1, such as 10, 11, 12, will be returned. All— Search results will be grouped by year, then month, then day. This option looks for a match anywhere in the date. For example, if your dataset includes dates from 2009 and the search term is 09, all dates from 2009 will be returned. If you want only the 9th day returned, use the Date option. Because searches are additive, proper application of the Add Current Selection to Filter in the search results allows you to include or exclude the results from the filter. Open the drop-down of the date column to filter. Select Date from the Search drop-down. Type in the two-digit date. Scroll down the filter listing and select the year of the data to include in the filter. Selecting the year will automatically select all the months and dates in the year’s group. Open the drop-down of the date column to filter again. Scroll down the filter listing and select the year of the data to include in the filter. Repeat steps 7 to 13 if you want to include more dates in the filter. Special filters are available in the filter drop-down depending on which data type (text, numbers, or dates) appears most often in a column. All the special filters, except for ones that take action immediately, open the Custom AutoFilter dialog, allowing two conditions to be combined using AND or OR. If the column contains mostly text, Text Filters will be available with the options Equals, Does Not Equal, Begins With, Ends With, Contains, and Does Not Contain. Selecting one of these opens a Custom AutoFilter dialog in which text can be entered. Wildcards can also be used in the text fields. Use an asterisk (*) to replace multiple characters or a question mark (?) to replace a single character. If the column contains mostly numbers, Number Filters will be available with the options Equals, Does Not Equal, Greater Than, Greater Than Or Equal To, Less Than, Less Than or Equal To, Between Top 10, Above Average, and Below Average. Selecting Top 10, Above Average, or Below Average will automatically update the filter to reflect the selection. If Top 10 is selected, you can specify the top or bottom items or percent to view. For example, you could choose to view the bottom 15% or the top 7 items. For columns with dates, the special filter offers a wide selection of options, including additional options under All Dates in the Period, as shown in Figure 4. 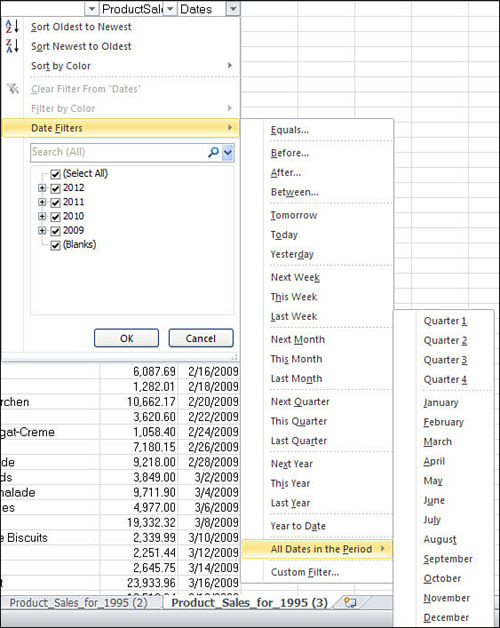 The Custom AutoFilter dialog for dates includes calendars to aid in data entry. The options dealing with quarters refer to the traditional quarter of a year, January through March being the first quarter, April through June being the second quarter, and so on. Figure 4. There are numerous options for filtering dates. Open the drop-down of the numeric column to filter. Select Number Filters, Greater Than. The Custom AutoFilter appears. The top-left drop-down should already have Is Greater Than selected, but if not, select it from the drop-down. The top-right drop-down lists all the values in the column. You may select one of those or enter your own value. Between the top and bottom drop-down, make sure AND is selected. In the bottom-left drop-down, select Is Less than. In the bottom-right drop-down, select a value from the list or enter your own value. Click OK. The sheet will update, showing only the values that fell within the selected range. Figure 5. 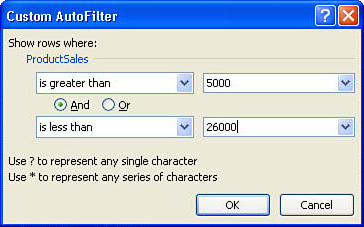 Use the special filters to filter a list for a range of values. 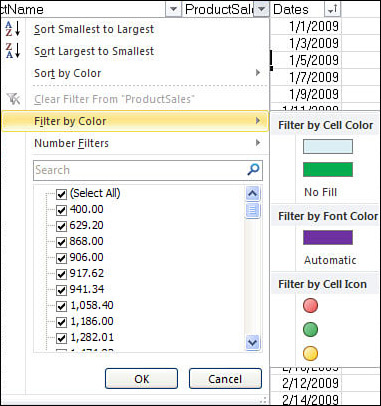 Data can be filtered by font color, color (set by cell fill or conditional formatting) or icon by going to the Filter by Color option in the filter listing, as shown in Figure 6. There, colors and/or icons used in the column are shown. Filter selections are additive, so if you first select to filter all green rows and then red circles, the filter range will reflect rows that have a green fill and red circle. Figure 6. The Filter by Color option allows you to filter by font color, fill color, or icon.